This 8 night/9 day birding and nature trip to Costa Rica gives avid bird watchers the chance to see some of Costa Rica’s rarest and most exciting bird species, plus, enjoy some of the other fantastic activities that Costa Rica has to offer. This Costa Rica Birding trip is a great combination of excellent bird watching, culture, and nature. 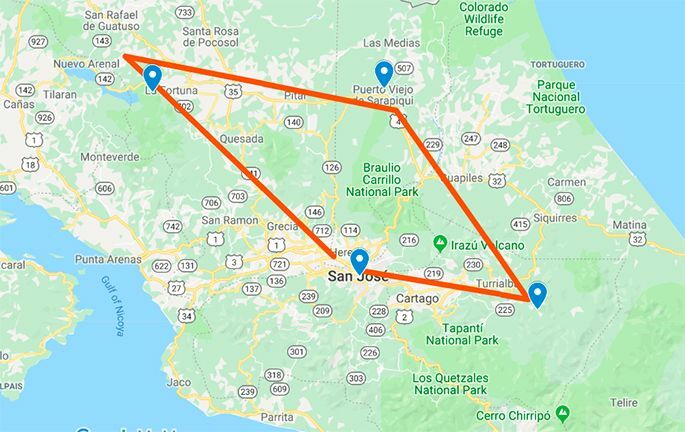 With your private naturalist birding guide, you’ll travel throughout the country on this small group trip to Costa Rica and experience paradise at its best. Welcome to Costa Rica! We will meet you at the San Jose International Airport. Your private guide will meet you at the airport and transfer with you to the charming Hotel Bougainvillea. Check in and enjoy the spectacular gardens at the hotel. This evening join your group for a Welcome Dinner. You will depart after breakfast, driving East towards the town of Turrialba. You will pass through the town of Cartago, the original capital city of Costa Rica, and then head into the country passing small towns, beautiful green hills, rivers, and forests. Your guide will be happy to stop along the way for birds and other sites. Your drive will take about 3 hours. Charming and friendly, Guayabo Lodge sits in a beautiful garden on the slopes of the active Turrialba Volcano. It’s a family run eco-lodge, renowned for good service and great views all around. The smoking Turrialba Volcano is to the North, the valley with the town of Turrialba and the Angostura lake to the South; Santa Cruz and the Caribbean to the East and the Cerro de La Muerte on the background to the West. This evening your group comes together for a fun hands-on cooking class. You will learn about local Costa Rican cuisine, and prepare a fabulous dinner with local, fresh ingredients. After breakfast, you will visit the Guayabo National Monument for bird watching and time to experience Costa Rica’s most important archeological site. The area includes ancient trails, petroglyphs, and homesites estimated to be more than 3000 years old. Your guide will tell you about the history of Guayabo and you’ll enjoy excellent bird watching in the surrounding forest. The Aquiares River Reserve is owned by Guayabo Lodge. You will have an early morning birding session (before breakfast) at the reserve, then have breakfast at the lodge and depart for Tortuguero. You will travel several hours north to the port of La Pavona where you will board your boat and travel through the canals of Tortuguero to reach your lodge. You will check and have lunch. After some time to relax, you will visit the town of Tortuguero and the Turtle conservation museum. You will leave with your guide on a wildlife-filled journey through the canals of Tortuguero. This area is often referred to as “The Little Amazon” due to the remoteness, lush forest, and wide array of wildlife. The canal network is home to 138+ mammals, 442 bird species, and 118 species of reptiles. Return to the lodge to relax during the heat of the day. Late afternoon join your guide, for some more birdwatching in the gardens. This evening, you’ll head to the beach to witness one of nature’s most extraordinary events. The nesting of the Atlantic Green Sea Turtles. During the prime nesting season from June through October thousands and thousands of sea turtles visit the beaches of Tortuguero at night. You will visit with a ranger, quietly waiting for the sea turtles to emerge from the ocean. You’ll see them crawl through the sand pick their nesting site and lay their eggs. It’s a once in a lifetime experience, Mother Nature at her best. After breakfast, you will board your boat, travel about 90 minutes through the canals of Tortuguero and then get back on your vehicle and depart with your guide heading west towards the Arenal Volcano. You will drive through beautiful rolling hills, farmlands with fields of yucca, groves of bananas, and acres and acres of pineapples, and soon the majestic peak of the Arenal Volcano will appear on the horizon. You’ll arrive at the Observatory Lodge for check-in. Today you will spend the day with your Naturalist Guide exploring the trails and gardens around the Observatory Lodge. This is truly one of the best places in Costa Rica for spotting wrens, antbirds, tanagers, hummingbirds, raptors, cotingas, woodpeckers, woodcreepers and so much more. It’s a true birdwatchers paradise. The forest is also home to many mammals. We will be looking for agoutis, anteaters, armadillos, peccaries, and much more. Enjoy this fabulous day of birding and interaction with nature. Late afternoon you will make a visit to the beautiful EcoTermales Thermal Hot Springs. Here you will have a chance to soak in the thermal mineral hot springs, surrounded by forest, soothing tired muscles and enjoying this unique feature of the Arenal area. Your group will enjoy a delicious typical dinner at the hot springs. This morning you will enjoy your last morning around the gardens of the Observatory Lodge and then have breakfast. The group will depart the lodge and make a stop in La Fortuna. You will have a chance to visit the central park or shop in some local shops. You will then begin the journey back to San Jose, birding along the way. You will make a stop for lunch and arrive at your hotel late afternoon. Tonight, join your group for a farewell dinner, toast your great memories and reminisce about your last 8 days in Costa Rica. This morning you will depart your hotel and transfer back to the SJO Airport for your flight home.